(Nanowerk News) An international research team based at The University of Texas at Dallas has made electrically conducting fibers that can be reversibly stretched to over 14 times their initial length and whose electrical conductivity increases 200-fold when stretched. UT Dallas scientists have constructed novel fibers by wrapping sheets of tiny carbon nanotubes to form a sheath around a long rubber core. 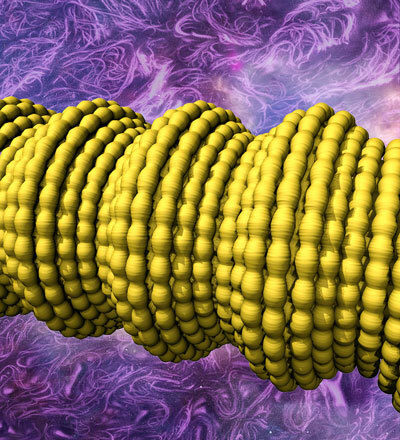 This illustration shows complex two-dimensional buckling, shown in yellow, of the carbon nanotube sheath/rubber-core fiber. The buckling results in a conductive fiber with super elasticity and novel electronic properties. In a study published in the July 24 issue of the journal Science ("Hierarchically buckled sheath-core fibers for superelastic electronics, sensors, and muscles"), the scientists describe how they constructed the fibers by wrapping lighter-than-air, electrically conductive sheets of tiny carbon nanotubes to form a jelly-roll-like sheath around a long rubber core. The near invariance of resistance during the stretching of 1) a carbon-nanotube-sheathed rubber fiber and 2) a hand-made conducting cable containing seven plied sheath-core fibers is shown in lab demonstrations. “No presently available material-based strain sensor can operate over nearly as large a strain range,” Liu said. Adding twist to these double-sheath fibers resulted in fast, electrically powered torsional — or rotating — artificial muscles that could be used to rotate mirrors in optical circuits or pump liquids in miniature devices used for chemical analysis, said Dr. Carter Haines BS’11 PhD’15, a research associate in the NanoTech Institute and an author of the paper. Scientists tested whether a carbon-nanotube-sheathed rubber fiber could be used as a conductive wire in a pacemaker cable. Watch the video in which an oscilloscope recording shows that the voltage pulses from the pacemaker are not affected by even extreme fiber twisting, stretching and bending. “This technology could be well-suited for rapid commercialization,” said Dr. Raquel Ovalle-Robles MS’06 PhD’08, an author on the paper and chief research and intellectual properties strategist at Lintec of America’s Nano-Science & Technology Center.